Punxsutawney Phil has come and gone, March 21st has been crossed off the calendar, my daffodils are desperately trying to poke through, the geese have come to the pond. Spring is teasing us all over the place. But we woke up to snow-covered ground this morning! What’s wrong with this picture? Even the robins look confused. Calls for another day of soup! In the meantime, I’m enjoying this hearty, warming and filling soup. My sister recommended this soup after another guest brought it to her new condo group’s monthly potluck. She loved it and I was anxious to try it, too. I had more than enough bulgur in the pantry and plenty of vegetables on hand. I even had the herbs de Provence the recipe called for; didn’t have to substitute my own mixture. But I decided to make it the day I also decided it was high time I saw my three-week old new nephew. I called his mother and announced I was bringing lunch, too. She told me her husband had the day off and would be extra delighted that Mr. Rosemary might be along, too. Hmmm, I got to thinking, two big men just might not think this vegetarian soup would be hearty enough. So, without making a trip to the store, what could I do? Since this isn’t my first rodeo, I have gotten in the habit of stashing a few freezer packets for just such moments. I decide to add about ¼ cup of chopped bacon and abut ½ cup of cooked chicken. That was all the soup needed to make it “manly.” Pretty quick to make and easy to tote. In the end, Mr. Rosemary couldn’t make it, but the proud new daddy did – and I’m pretty sure the little bit of bacon did it. Heat oil in a heavy large pot over high heat. Add root vegetables and onions. Sauté until beginning to brown, about 10 minutes. Add vegetable broth and herbes de Provence’ bring to boil. Add bulgur, bacon and chicken pieces; cover pot and reduce heat to low. Simmer until bulgur is almost tender, stirring occasionally, about 15 minutes. Add spinach; stir until wilted, about 1 minute. Taste and add salt and/or pepper if you want. 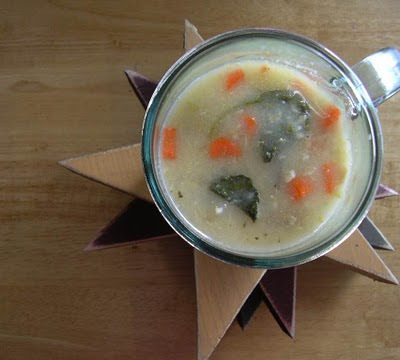 This winter soup looks delicious! We are all chomping at the bit for Spring. It is supposed to be rainy today, and the street cleaners have already been around so Spring is here..I think. Something about the word "bulgur" just turns me off but if you made it, I'd definitely try it! Haha - winter is trying to stay here but spring is certainly fighting it's way in. I love soup - it is so comforting no matter what the weather. Looks lovely and so comforting when its cold outside, hurry spring - no more soup for a little while. This soup looks so good! Hopefully Spring is here!! That is a beautiful photo. Never tried bulgur in soup but will have to give it a go. My daffs are blooming beautifully but the weather has turned cold again. Perfect soup weather! I'm just as confused as those little robins! I'm looking forward to spring too and the change it brings to our palettes. But I'll miss those roots vegetables that I love so much! Lovely soup. I looks and sounds delicious. Spring is coming! Spring is here! What a great way to end the winter season though. I love adding bulgur to soup. It makes the meal so much heartier. Thanks for sharing, my dear friend. It feels good to return to the blogs I love after such a hard and trying week. Your words and photographs bring a smile to my face. I would definitely love soups made with bulgur! Very healthy and delicious with all sorts of vegetables. Such a healthy and delicious hearty soup. It's a meal all by itself, with a nice crusty piece of bread!